Just last week, I received an email from a parent with a very good question. She wrote to me asking for advice on what she, as a parent, could do to help her Autistic son succeed. In fact, it was such a good question that I emailed her back asking permission to do a blog entry on it! As someone with an Autistic son, I share this parent’s desire for any ideas on how to help my child to achieve. In fact, I am willing to bet that you would be hard pressed to find a parent who doesn’t want an answer to this question, regardless of having a child with Autism. There are a number of well known child psychologists who make a great deal of money selling their version of an answer to this question in books, seminars, and talk shows. Most of them have some good ideas that work with some measure of success. Unfortunately, a number of times the solutions they propose are not always effective in dealing with an Autistic child. Now, I need to take a moment to point out that anything I have to say is just my opinion and my ideas. I am not an expert, I am not a child psychologist, I have not published any books on parenting, and I don’t think there is anyone out there that would be insane enough to allow me to host a talk show. That disclaimer out of the way, I do feel that I have somewhat of a unique perspective on raising an Autistic child. After all, I have 6 years of experience from the parent’s perspective and 30+ years from the Autistic’s perspective. In looking at Connor, I have thought a lot about how I developed, what helped me to get where I am today, and what could have helped me even more. One of the most important things my parents did for me was to pay attention to my unique interest and foster them. As a child, I was fascinated with two things: Lego blocks and entomology. Ok, fascinated is putting it mildly… I was obsessed with Lego blocks and entomology, to the exclusion of just about all other things. I always had Lego blocks of some sort with me, no matter where I went. And trying to get me to walk past an interesting bug would have made splitting an atom look easy. My parents never discouraged my interests. Instead, they would buy me books on insects, microscope sets, and an endless supply of jars for specimens. If I wasn’t collecting bugs, I was playing with my Lego blocks. I would spend hours… even days creating complex things out of them. My parents encouraged my buy willingly providing me with ever more complex sets that included unique gears, pneumatics, and electric motors. The support they offered me was truly beneficial. If it were not for the books on insects, I can say with assurance that my reading skills would still be lacking. With such an obsessive pursuit of scientific knowledge, I found the only way to quail my thirst was by reading. By supporting my Lego block habit, my parents, inadvertently, helped me to develop some of the fine motor skills that I was lacking. In addition to that, the Lego blocks helped me to develop an understanding of physics at a rather young age and gave me a better understanding of spatial orientation. So, my first tip is to look at your child’s particular area of interest and foster it. I recently read a message on an Internet forum where a parent was wondering how they could stop their child from being obsessed with cars. I was floored at the idea that a parent would want to discourage their child’s interest, just because they didn’t see it as “normal”. That leads me to the second tip. One of the most destructive things a parent can do is to get hung up on the concept that their child must play in a neurotypical fashion. It is impossible to describe the negative impact that forcing neurotypical stereotype onto an Autistic child can do. I know… I have been in the position of being told that what I was doing was not “normal” and I shouldn’t do things that way. Fortunately enough for me, it was not from my parents. Tip number two, then, is not to force your child to be neurotypical. Individuality is a good thing, especially for an Autistic. I must make another disclaimer here: This does not mean that if a child is doing something destructive to themselves or others that it should be allowed. There is a definite line between destructive behaviors and those that may actually be beneficial. How you react to and deal with destructive behaviors is important. Something that parents must always remember is that there is a reason behind the behavior. As an example of this, I used to bang my head. In fact, I would do it rather frequently and probably caused more than my share of concussions doing it. A common misconception with head banging is that this is an attempt by an Autistic person to hurt themselves. Let me tell you that, at least in my case, this was far from the truth. A closer explanation can be found in the realm of sensory integration problems. I frequently have problems with hearing too much and feeling things touching me too much, also known as auditory and tactical sensory issues. As a child, I discovered that hitting my head against something would cause pain. Pain, for me, was an overwhelming sensation that took precedence over all other sensations… I could focus on it. So, I would hit my head to cause pain which would drown out the other overwhelming stimulus. The side effect of this was that I could have easily done serious damage to myself… like the time I did this on the concrete sidewalk. Sensor integration problems and the solution I found as a child are not uncommon in Autism. If it isn’t head banging, it is pinching, scratching, hair plucking, or one of many other destructive stimulation activities. It took me well into my adulthood to determine that these actions were negative and that they could be replaced with other actions to deal with the problem. Had my parents realized why I was banging my head, I am sure I could have saved myself a great number of headaches. The third tip, then, is if your child has destructive behaviors, you need to stop them. To do this properly, you will need to figure out another way to allow them to escape from the overwhelming stimulus of the world around them. 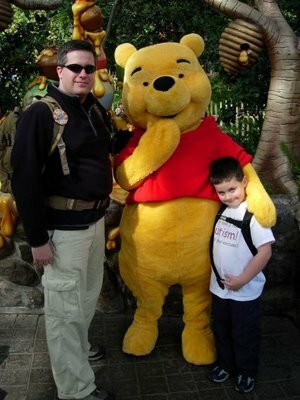 One thing many parents have found to be helpful are weighted vests. These can help the child to gain control of the environment by concentrating on the powerful tactile sensation. My last tip is, in my opinion, the single most important. Tip number four is to believe in your child and make sure they believe in themselves. Nothing is as destructive to a child as a parent who has already given up on them. Everything we, as parents, do and say is recorded in the child’s mind. Discouraging them from trying new things because you don’t want them to “fail”; talking about them or to them as being limited in ability; treating your child as the product of mercury poisoning or like they are somehow broken. These things will, without a doubt, destroy any self esteem they might be able to muster. The last person an Autistic child needs to hear, see or come to believe this from is their parent. Henry Ford once said “If you think you can do a thing or think you can't do a thing, you're right.” I would only change that by saying that if you think your child can do a thing or you think your child can’t do a thing, you’re right. One last thing… Remember that I am not a professional, nor do I claim to be. Take my advice as you see fit.